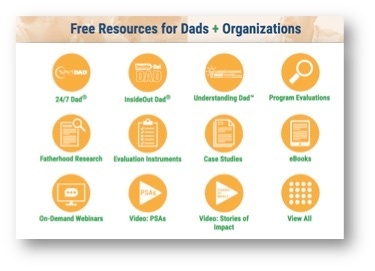 A majority of folks in the fatherhood field initially learn about NFI because of our popular, core curricula: 24/7 Dad®, InsideOut Dad®, The 7 Habits of a 24/7 Dad™, and Fathering in 15™. But what some people don’t realize is that we also specialize in providing free resources to help you be successful in general in your work with fathers and families. In fact, when NFI staff “walk” people over to our Resource Library on Fatherhood.org, they are astounded, and often overwhelmed! Where do I begin? What do I look at first? What do you have that I need? These are the questions we often hear. In this post, I will provide an overview of our Resource Library, what you will find there, and in some cases, how you can use it. To begin, here’s the link to our seriously awesome Resource Library. The Resource Library is organized by resource and media type, allowing you to click into any of the individual sections, or simply click ‘View All’ at the top. A collection of all NFI program evaluations and studies that have been conducted over the years. How to Start a Direct Service Fatherhood program… and more! Practical Tips to Engage Fathers in Home Visits… and more! Now it’s time for you to dig around and find what will help you and your fatherhood program! We hope that these and future resources continue to help you meet the needs of the fathers and families you serve. Thank you for all that you do.